1977-04-09. New. Ships with Tracking Number! INTERNATIONAL WORLDWIDE Shipping available. Buy with confidence, excellent customer service! Penguin Books, 1977-01-27. Paperback. Used:Good. New York: Viking, 1963. Nice book in a jacket with nice front and rear panels, but the spine is rather heavily pitted due to insect degradation probably.. First Edition / First Printing. Hardcover. Near Fine/Good. New York: Penguin Books. 1977. First Edition Thus; First Printing. Softcover. 0140044507 . Very Good in wrappers. Mild toning to pages. Slight edgewear. Some makings on pages. ; 7.60 X 5 X 0.60 inches; 320 pages . Penguin Books. PAPERBACK. 0140044507 Crisp pages. Tight binding. Different cover than shown. Moderate shelf wear on cover. Light tanning. Some writing/underlining. . Very Good. MILANO, ITALIA: BIBLIOTECA UNIVERSALE RIZZOLI, 1974. ITALIAN TEXT. OWNER'S NAME, CLEAN TEXT.. PAPERBACK. VG. New York: Penguin Books USA. Very Good. 1994. Softcover. 312 pp. Index. Edgewear, corners rubbed. Revised and enlarged edition. 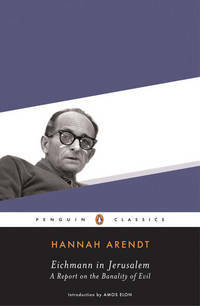 The authoritative account of the trial of Adolf Eichmann. ; 12mo 7" - 7½" tall . Penguin Classics. Very Good. 2006. Paperback. 0143039881 . No marks, very clean. ; Penguin Classics; 336 pages .